How do you introduce people to Jesus Christ who have had no contact with the Bible or its message? How do you reach those who have had no contact with the church and do not understand Christian terminology and may have a negative view of Christians? This is the culture in which we now find ourselves. By explaining how to use Bible discussion groups to introduce the gospel message in a relevant way in today's post-Christian culture, this book introduces the reader to a new and radical form of the small group Bible study. This study is solely oriented toward the needs of the post-Christian. This book trains the reader to establish, grow, and lead Bible studies oriented toward those who do not understand Christian vocabulary, have little or no knowledge of the Bible, and have never heard the gospel. The author believes that the best missionary is the Bible itself. Instead of the leader answering any questions the attendees may have, the Bible provides the answers to questions posed. Thus, this book will give the reader confidence to let the Bible do the important task of evangelism. ""Our fast-paced life is filled with all kinds of changes. One thing remains constant, however: the gospel of Jesus Christ is communicated between people who know, value, and trust each other. My own life with God began in a small Bible discussion group in a friend's apartment where we read the Bible and shared our lives. That experience changed my life."" --Manfred Beutel, Pastor, Hannover, Germany ""It is important for us to not only be involved with our church, but to also know what is going on in the lives of people we come in contact with. What are their concerns, dreams, questions? ... The greatest challenge is to communicate the gospel without coming across as spiritual 'know-it-alls.' Bible discussion groups offer a way out of this dilemma. Leaders use the Bible to answer questions. God speaks directly to the heart of the person and they discover for themselves the answer to their questions."" --Reinhold and Andrea Barie, Neuhofen, Germany ""The greatest advantage of Bible discussion groups is found in the slogan: 'We only answer questions that are asked.' As leaders, we are not there to give our opinions, but instead, concentrate on the concerns and needs of the group. As our initial group ended, two of the women continued on in another Bible study. They also took part in church retreats and other church activities and occasionally attend church services. It can take a long time for a person to come to faith in Christ. The personal contacts that began in our Bible discussion group continue to grow."" --Bernd and Suzanna Friebel, Neuhofen, Germany Fred McRae, a missionary with Global Outreach International, has worked in Germany as a church planting and church growth consultant since 1986. Before arriving in Germany, he planted churches in Texas and Oklahoma. He received a ThM from Dallas Theological Seminary in 1980. In 2009, he earned a PhD from the Evangelical Theological Faculty, in Leuven, Belgium. He is the author of A Case Study in Contextualization: The History of the German Church Growth Association 1985-2003 (2014). 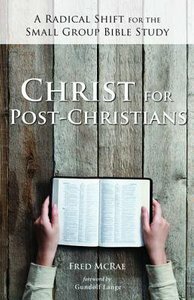 About "Christ For Post-Christians: A Radical Shift For the Small Group Bible Study"